My Mum makes some simple recipes with very few ingredients that have amazing depth and rich flavour complexity. She swears it's her home-made chicken foot stock that makes everything taste so good. Mum has a pressure cooker (a badass old skool cooker; that thing scared me as a kid and scares me now) so she often uses that to make stock. She also has been playing with her new slow cooker so I asked her to try making the stock with it as I don't know many people who own a pressure cooker these days. Turns out it worked just as well in a slow cooker just (obviously) took longer than cooking them in the pressure cooker. Ready for this incredibly complex recipe? 2 lbs (1kg) Chicken feet - most come de-skinned*. Look for pink feet. If using pressure cooker, cook at low pressure for about 1 hour. Let cool to room temperature, remove chicken feet**. Put broth in refrigerator. As it cools it will solidify into an amazing mass of gelatin. Portion out as you like; freeze what you don't use right away. Makes about 4 cups. Mum doesn't use any spices in her cooking water so you can use it for any type of soup. However, you certainly could add the typical poultry type veggies, spices and herbs to the cooking water to make it taste like traditional chicken stock. *If the feet still have their skin on (they look yellow instead of pink) de-skinning them is easy. Check out this Simply Recipes post for details (one of my fave cooking blogs even tho' not primal). **I'd be composting the feet at this point but Mum says soak them in soy sauce (gluten-free), tamari (San-J has gluten free, organic, non GMO) or coconut aminos and eat them like dim sum. Shudder. Thats it! Next up, some recipes of Mum's that use the chicken foot stock. What are your favourite chicken stock recipes? 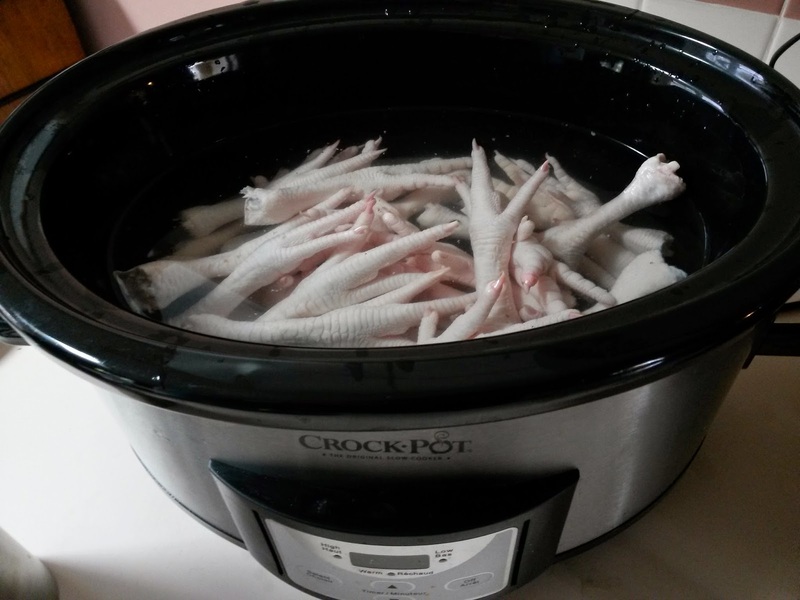 Would you change to making stock from chicken feet? Already do? Let us know!